I know from going to quilt shows that the better the buzz, the more the excitement. Well this buzz rivals a really well attended quilt show. Oh my folks are excited and enjoying what they’re seeing. 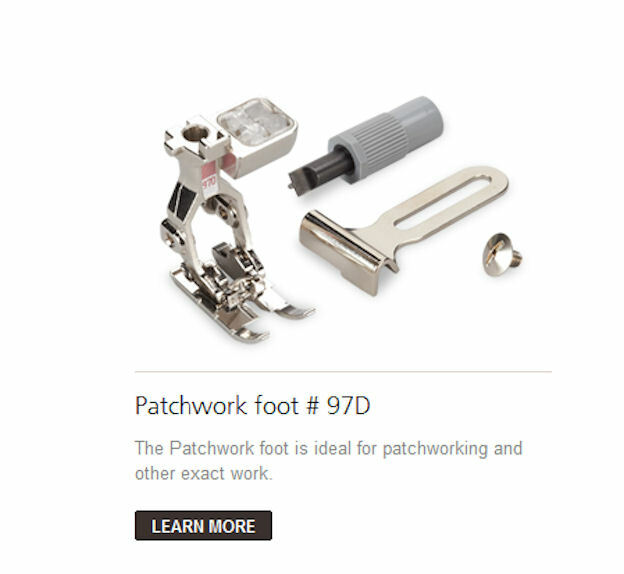 I’m really excited about the new presser foot for machines with 9 mm stitch width, #97 and #97D Patchwork foot. This extends the line of Patchwork feet from 4 to 6 including the 37 & 37D, 57 & 57D . There will be a few new machines coming out including the Ricky Tims and Tula Pink Special Editions of the B 350. Tula’s is embossed and they are both gorgeous looking machines. There were other things to be learned that need to wait for a bit. I didn’t take as many classes as I thought. As I was headed out to the first one this morning I was delayed talking with one of the educators; then I went to the wrong room for the 2nd and ended up being late enough that the teacher was talking when I arrived. (I didn’t want to walk in on the presentation). I did get to the final presentation that I wanted to attend and enjoyed that immensely. I posted a quick blog this morning sharing where my quilt was located and it has been right in my line of sight all along. hen I realized that I totally cracked up, I mean how do I see everyone quilt and not my own? I do have more to share and will do so in a day or two. Tomorrow is the travel day so I’ll be leaving the hotel no later than 7:30 in the morning. What makes the 97/97D different than the other 1/4 inch feet?